We offer a range of Awning Accessories that can be combined with any of our awnings to compliment your own style of outdoor living or commercial premises. Whether you want a completely automated system for ease of use or tasteful light and heating solutions so you can enjoy your outdoor space for longer, we can help. Browse our range of Awning Accessories below. Continue to enjoy your outdoor space well into the evening with some beautiful awning lights. Our Awning Light Bar system is available in 1400 and 200 options depending on how much light you require. 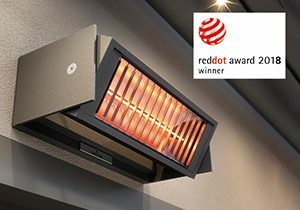 Take off the chill and continue to enjoy your outdoor space all year round with an Awning Infrared Heater. 1400 and 200 watt options are available depending on the area that needs to be heated. Add a side screen to your retractable awning for added privacy as well as extra protection from the wind and sun. 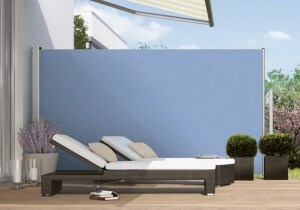 This can be perfectly colour matched to your awning for a complete look. 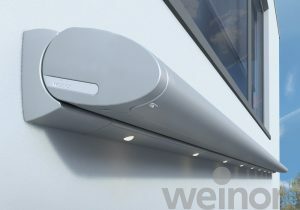 LED spot lights for the front profile of your awning. Lights can be rotated vertically up to 90 degrees to create the perfect ambiance. Infrared halogen technology for increased warmth at the touch of a button. Super efficient with even heat distribution. Enjoy extra shade with the markilux Shadeplus drop down valance. The extra fabric can lower down up to 2.10 metres.